Becoming a teacher is hard work and staying in the profession can be even more daunting. A new University of South Carolina program aims to be a supporting bridge between its education graduates and the classroom. On a Saturday in October, Alison Schriro, a 23-year-old math teacher at Dreher High School, gathered with 13 other newly minted teachers to dissect the joys and frustrations of teaching. While there were many stories shared, the overwhelming majority were about students. “I love the content I teach and helping students go from ‘I don’t understand’ to ‘Look what you just did,'” Schriro said. 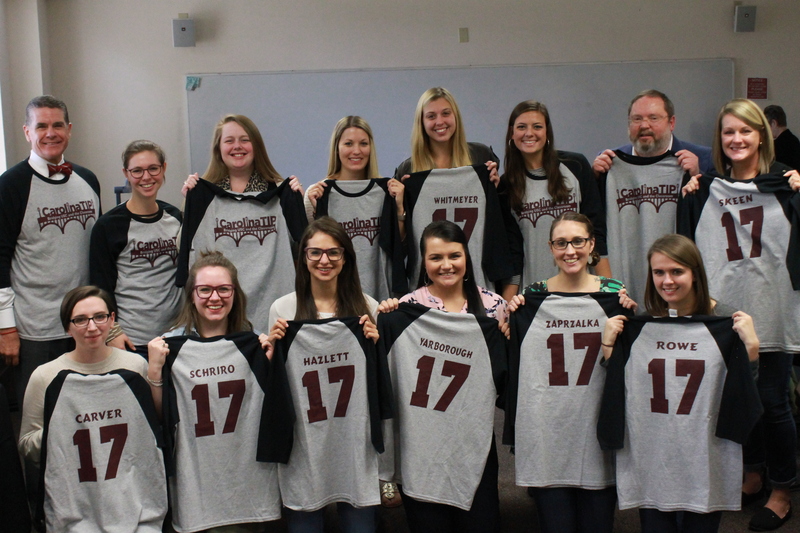 That Saturday was the first official meeting of the Carolina TIP program, designed to “build a bridge between the university and the classroom” for teachers that recently graduated from the University of South Carolina. TIP, which stands for Teacher Induction Program, is available for USC College of Education graduates who intend to become certified to teach in S.C. schools. The program, which provides support for teachers up to three years after graduation, aims to have a positive impact on student learning, teacher efficacy and teacher retention. Nicole Skeen, 38, the university induction coordinator and Carolina TIP director, led the meeting with help from several of her colleagues. The room was filled with excitement, determination and most importantly – lunch. South Carolina’s education system still remains in question. There’s the historic 1999 Abbeyville County School District v. the State of South Carolina case, which detailed how South Carolina failed to provide a “minimally adequate” education to certain school districts, and even Charles T. Ferillo’s “Corridor of Shame,” which documented the poor conditions of rural school districts throughout the state(www.sccourts.org). The state is also cancelling a well-known teacher retention program known as “TERI” that “allows employees to retire and continue to work at their same salary,” essentially pushing teachers into another tight spot (www.thestate.com). S.C. officials are not demonstrably putting education first, and the rankings published by U.S. News & World Report could be interpreted as apathy towards the problem. South Carolina was ranked last when compared to the other 49 states in K-12 public education. The issue at hand isn’t one with an easy, clear-cut solution, education officials say. It is, rather, one that requires rebuilding of the system from the ground-up – and that starts with the teachers. But a teacher shortage is hampering that effort. According to CERRA, South Carolina’s Center for Educator Recruitment, Retention and Advancement, there were a reported 481.24 full-time equivalent vacant teaching positions in South Carolina public school classrooms (www.cerra.org). This number is up by about 32 vacancies when compared to the data from the 2015-16 school year. Not only is the number of returning teachers declining, but the number of graduates completing their certifications to teach in South Carolina is dropping as well. The number of graduating teachers who became certified in 2016-2017 was 1,898. However, the number of teachers who did not return to their teaching position in 2016-2017 was 2,465. That means there was a deficit of 567 teachers, and worse, that deficit has steadily grown over the past years. Jon Pederson, 57, the current dean of the College of Education at USC, said the teacher retention rate in South Carolina was at a “crisis” level. He also emphasized that the focus should be on helping the communities affected grow as a whole, in order to make teachers working or living in said areas feel more secure. Pederson received his teaching credentials from the University of Nebraska in chemistry and physics and has been working in education, leadership and research positions for over 30 years. He is involved heavily with the Carolina TIP program as well. Doug Smith, 31, an assistant professor and educational leadership and policies coordinator at USC’s College of Education, conducts research to determine the most important factors that influence teacher recruitment. Smith came to the conclusion that while salaries, signing bonuses and prepaid college tuition for aspiring and new teachers is essential, the most important factor in recruiting and retaining new teachers was school administrative support. Teachers who participated in comprehensive induction programs and who had hands-on mentors their first year inevitably felt more confident and comfortable with their workplace, he said. The induction programs for new teachers vary by district and are essentially regulated and enforced by the administration in charge of the specific school. This lack in uniformity creates an uneven playing field and results in discrepancies in how comprehensive the programs are, further separating potential teachers from teaching in areas that need them most and that may not be able to provide an adequate induction experience, he said. Even worse, according to Smith, there isn’t even an induction program at all for administrative positions in S.C. schools – creating an issue of recruitment and retention among the very people in charge of hiring and putting in place an effective induction protocol. It creates a snowball-type effect that continues to build on itself. Schriro, the Dreher High School teacher, reaffirmed Smith’s findings and further emphasized the importance of feeling comfortable in the workplace. – “These U.S. States Have the Best Education Systems.” U.S. News & World Report, U.S. News & World Report, www.usnews.com/news/best-states/rankings/education. – CLICK, CAROLYN. “SC Supreme Court Finds for Poor Districts in 20-Year-Old School Equity Suit.” Thestate, www.thestate.com/news/politics-government/article13911206.html. – abeam@thestate.com, ADAM BEAM -. “Senate Panel: End TERI Plan by 2018.” Thestate, ADAM BEAM, www.thestate.com/latest-news/article14403473.html. – “Supply and Demand.” CERRA, www.cerra.org/supply-and-demand.html.